In just sixteen days, 60,000 gamers beat Pokemon -- all playing together as one player. Backseat drivers are the worst. But it would be worse if you had to obey every command they shouted out. And it would be even worse if there were, say, 60,000 people in the backseat, and you still had to obey each direction. Sounds like a nightmare, but it's not. This is Twitch Plays Pokémon – thousands of viewer/participators on the Internet shouting commands to one lowly screen playing Nintendo's Pokémon. This recently happened and went strong for over two week as a massive audience congregated in a chat room to watch a live feed of a game of Pokémon. The twist is that the chat room controlled the player. So instead of one individual making each command second to second, it rotated between 60,000 people each taking a turn every second. It is as beautiful as perplexing and chaotic as you imagine. And what is more incredible is that beyond all doubt, this gaggle of gamers beat the final boss on day sixteen. Pokémon is the wildly popular handheld game franchise from Nintendo. I'm sure you've heard the popular catch phrase of needing to "Catch 'em all!" but if you're unfamiliar allow me to briefly explain. Pokémon is a game about collecting fantasy beasts that you then train and use in friendly spars with other trainers. 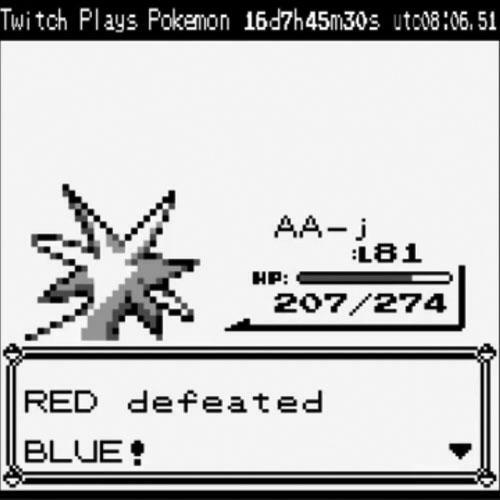 But what's happened with Twitch Plays Pokémon took the game to a whole other level. Explanations are in order. First, Twitch.tv is a fast-growing website that is dedicated to gamers who broadcast – or stream, as most call it – themselves playing games to anyone willing to watch. There are wide arrays of streamers, and viewers can watch their favorite game being played or see what their favorite streamer is up to. Want to watch some Call of Duty played by a "pro-gamer?" Twitch has you covered. Want to watch some people build cool monuments in indie-hit Minecraft? There are streams for that. Just from the front page alone, I noted that there are roughly 300,000 people watching the more popular games – and roughly 60,000 dedicated to Twitch Plays Pokémon. 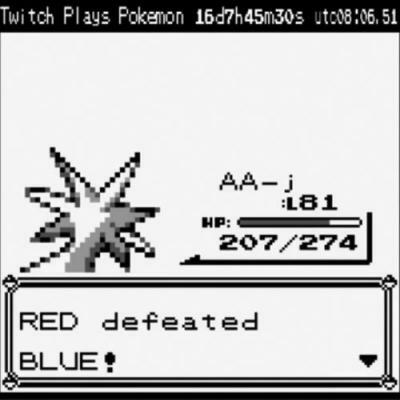 So how did Twitch Plays Pokémon happen? Some industrious-minded people wanted to run an experiment with the chat rooms on Twitch.tv. They wanted to see if they could hook the chat up as a controller to a game that requires turn-by-turn commands, like push a button to move one unit. If I were to write the word "up" in the chat room, Red (Pokémon's default protagonist name) would move up. Remember that bit about backseat driving, and how it's the worst? Imagine 60,000 different, unsynced commands flying at a game randomly: Beautiful, contained, geeked-out chaos. If you are just a casual observer watching the stream, it all seems pretty tame. The character on the screen is moving in very odd and nonsensical patterns because, well, it can't tell which backseat driver to listen to first, so it all just looks very random. However on the right side of the screen, you can see the battle wage. A single user can only give a command every 30 seconds, but with 60,0000 commands flying the stream of text is an incomprehensible torrent. In all actuality, it is amazing anything ever got accomplished. To help this, the host of this experiment introduced a new system to further play with this hiveminded approach. Two commands were added as options for players to use: anarchy and democracy. These two political ideas are contextualized as a bar with a line separating the two at the halfway mark. As more viewers clamor for anarchy, the bar fills past that halfway mark and anarchy is the rule. All commands slung out are sent to the game client and executed. If democracy reigns, the game pool voted for a 10-second period and used the winner of that vote as the next command. It's worth noting that the Twitch Plays Pokémon purists want to protect anarchy, as that is how the game was originally incepted, but a new faction fought for democracy to assume control of the hivemind. What is probably the most incredible aspect of all is that they actually beat the game. While it may take someone a day or two of playtime to complete the game alone, it is incredible to know that in just 16 days, tens of thousands of people can effectively brute force their way through it. Wasn't there some saying about infinite amount of monkeys typing on an infinite amount of typewriters would eventually compose Shakespeare? I guess it might be sort of true – even if they are all kicking and screaming like a bunch of backseat drivers.